Michael McBride …. great friend, great author. Met him through Toby Tate (last months Author Spotlight). Michael is the author of suspense filled, fast paced, spooky, all around mind twisting books. Michael’s books, always leave me breathless and wanting more. They are full of twists and turns that you never see coming, never thought possible. My first book of Michael’s that I read was SNOWBLIND. Its about 4 buddies who, during their hunting weekend, become the hunted. A great scary read. The ending …. I never saw it coming. I’ve also read, F9, about the medical field, doctors and psycho killer patients. Another with a great ending. SUNBLIND… a group of people trying to cross the desert from Mexico into the USA. Something is on the hunt. CONDEMNED … takes place in Detroit, Michigan (not far from home). About a PI trying to solve some murders, and at the same time, is being blamed for them. Who’s framing him ?!? You will have to read and just find out. One great read, and one of my favorites of Michaels. Also read, ANCIENT ENEMY …something has come back from the past. Again, full of twists and turns and a shocker of an ending. Some of his other releases are ….. BLOODLETTING, THE COYOTE, THE EVENT, REMAINS, FEARFUL SYMMETRY: A THRILLER, PREDATORY INSTINCT: A THRILLER, INNOCENTS LOST: A SUPERNATURAL THRILLER, THE GOD’S END TRILOGY… THE FALL (BOOK 1), BLIZZARD OF SOULS (BOOK 2), TRAIL OF BLOOD (BOOK 3). and the list goes on and on. Be sure to check them out !! Thank you for taking the time to answer some questions for me. 1. When did you know you wanted to write and be a writer? I don’t think it was ever really a conscious decision. I’ve been writing stories for as long as I can remember, from fantasy in elementary school to horror in high school. It wasn’t until my freshman year in college, though, that I started thinking there might be a future in it. A whole lot, to be precise. There was a time when I knew that answer off the top of my head, but anymore I focus more on what’s ahead of me than what’s behind. 3. How do you find the time to write? It’s not so much a matter of finding it as it is of making it. The hours at my day job are inflexible and my kids’ schedules take priority over mine. Throw in the fact that my wife works graveyard shifts and I have to be creative to scrape out blocks of writing time wherever I can. It’s definitely a challenge. 4. If Hollywood came knocking, and wanted to make a movie out of one of your books, which book would you pick? A think BURIAL GROUND would be a lot of fun. There’s plenty of action, plus the reveal at the end would be really cool with the kind of special effects at our disposal. 5. Who would you want to see in the movie? 6. What is your typical writing day like? I write longhand, so I spend somewhere in the neighborhood of an hour and a half typing the previous day’s work. That way the storyline is still fresh. Then I write for as long as I can, until I either run out of time or reach a decent breaking point, in which case I’ll try to get a jump on the next day’s typing. I get about twenty-five to thirty hours per week, so I need to make each and every one of them count! 7. How do you spend your time off? Time off? What’s that? Schedules and finances permitting, I enjoy taking my younger boys to the Avalanche games and the whole family to Disneyland. 8. What type of books do you enjoy reading? Thrillers, suspense, mystery…anything dark and action-packed with a plot line that keeps me guessing. 9. Do you have a favorite author and book? I couldn’t possibly pick just one! I love John Connolly, Michael Marshall, Lee Child, Michael Connelly, James Lee Burke, and a host of others whose annual releases I preorder the moment they go on sale. Book-wise, I could argue any number of titles, but I enjoy serial characters most, so each book is essentially another chapter in a much larger, evolving body of work. Charlie Parker, Dave Robicheaux, Harry Bosch, Jack Reacher, and Pendergast are some of my favorites. 10. I know you have a “normal” job. Do you think you would be doing that job even if you hadn’t started writing? I’d undoubtedly still be working in healthcare. I enjoy the patient interaction and the variety of studies, from x-ray to CT to MRI. Without the writing, I’d probably be a whole lot more ambitious, but the mere thought of taking on any additional responsibility makes me physically ill. I’ve reached a fairly comfortable balance between my professional lives that I hope to maintain for the foreseeable future. 11. Who would you like to co-write a book with? I’ve written books with Norman Prentiss and William C. Rasmussen, both of whom are terrific guys and good friends. I learned a lot from those experiences, but I vastly prefer working on my own. I guess I’m just not collaborator material. 12. Do you have a favorite childhood book? 13. CONDEMNED just came out (btw one of my favorite books of yours), do you have any other new releases out soon? I have Snowblind: The Killing Grounds coming from DarkFuse in November and stories in Shocklines: Fresh Voices in Terror from Cemetery Dance and Library of the Dead from Written Backwards. With any luck, I’ll be able to announce something exciting for summer release. Cross your fingers. 14. What are you currently reading right now? I’m reading the Game of Thrones books for pleasure and the MRI Cross-trainer and Cross-sectional Anatomy for work. 15. Any advice for anyone just starting out? Hone your craft. I know how tempting it is to self-publish or sign with a micropress. Seeing your book on Amazon is a great feeling, one that validates all of your hard work, but you’re doing yourself a great disservice. Take the time to improve your skills and develop your voice. Take your lumps from editors and agents. Learn from every rejection and criticism. Become the writer you know deep down you can be and build your career the right way. Thank you again Michael for taking time out of your busy schedule to answer questions for me. Such an honor to have you as my Author Spotlight this month. 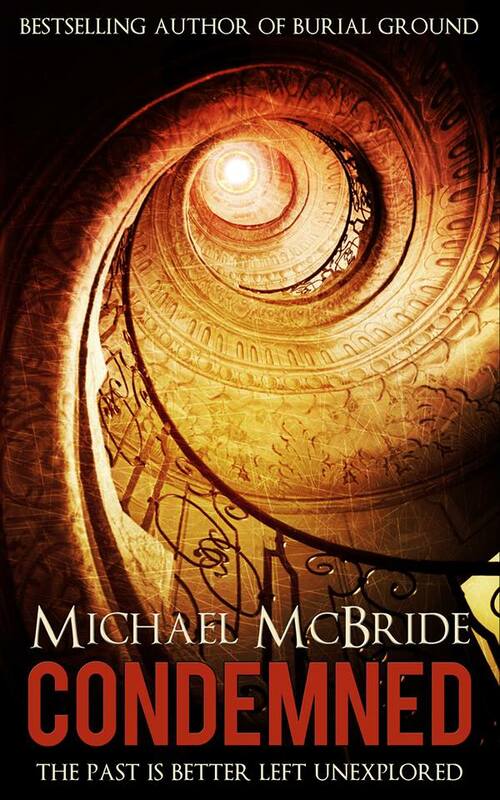 I hope, dear readers and followers, that you pick up Michael McBride’s books. All great reads !!!! During this month, I will be reading ……….. THE GOD’S END TRILOGY ….. THE COYOTE …. and if I can read fast enough …. BLOODLETTING and THE EVENT. Join along and lets talk books !!! March’s Author Spotlight…. the awesomeness Michael McBride!!! !